dry more clothes like in less space with this cloth hanger with 8 removable clips. 8 clips fastened with the arms of the hanger never get misplaced or lost. hangs on clothesline or drying rods with a hook on top. Fold away when not in use. 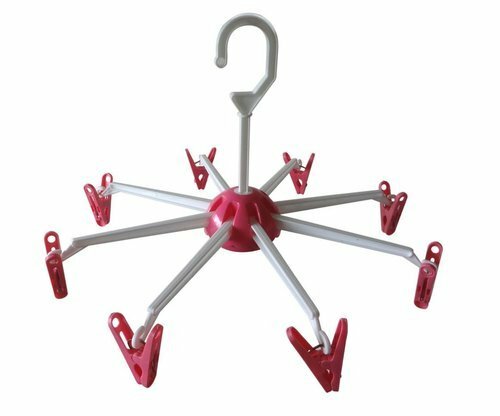 free spinning hanger gives more freedom and flexibility to hang clothes. Dry and hang innerwear, napkins, towels, handkerchiefs, baby clothes and more, conveniently and easily with this clothes hanger. available in multiple random colors. All colors are equally good; however option to select a particular color is not available with this product. subject to available stock. No return. Full payment advance. Packaging Details Normal had board packing with plastic bag. We are doing trading and wholesaling in the field of kitchen and home. Our operation executive source such product which are innovative for women use in kitchen and home. The Enjoy Ride aim to expand its business sale across India through e-commerce platform. Our motto are to provide the satisfaction to our valued customers always.We are providing home product categories for kitchen, toilet cleaning, gardening and house work. The company shall be happy to have various demand from customer. we will diversify in various product segment soon and add the same to sale in our product line catalogue time to time.we sale generic products.